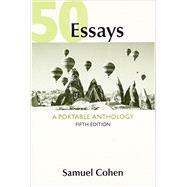 50 Essays: A Portable Anthology is the best-selling value-priced reader in the country because its virtues don't stop at the price. The book’s carefully chosen selections include both classic essays and high-interest, high-quality contemporary readings to truly engage students. The editorial apparatus is flexible and unobtrusive enough to support a variety of approaches to teaching composition. In its fifth edition, 50 Essays continues to help students acquire the critical thinking and academic writing skills they need to succeed, without making a dent in their wallets. NOTE: Sherman Alexie, "The Joy of Reading and Writing" is not available in the e-book by preference of the author. Sherman Alexie, "The Joy of Reading and Writing" is not available in the e-book by preference of Sherman Alexie. William F. Buckley Jr., Why Don’t We Complain?